I got the crafty bug. Sometimes I really don't like the fact that if I see something somewhere, I think, "I can make that". The problem is, I have to do it and get it out of my system. I saw some adorable tshirts on etsy.com for toddlers. 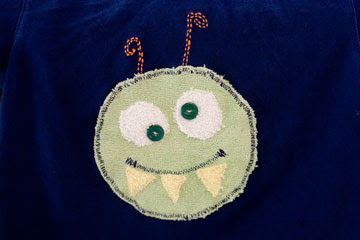 They were simple, applique ties, monsters etc. So I tried my hand at two. Granted they are my very first attempts and hopefully my technique will get better. I have a few others in mind that I want to try. It's a pretty simple process. 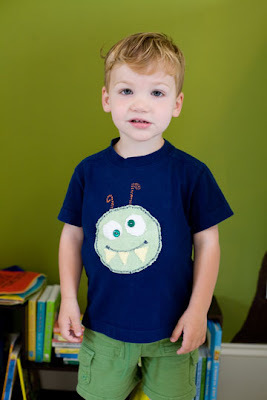 I bought some no sew adhesive, bonded it to the shirt and then stitched around the sides with my sewing machine. Pretty cute, huh? The second shirt was more involved. I took 3 old washcloths and cut out the pieces, the green head, the eyes and the teeth. I again used the no sew adhesive and then stitched around the sides. 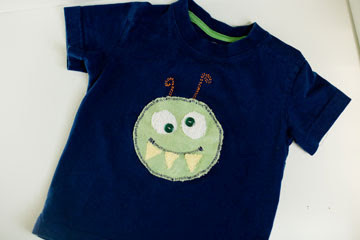 I used a zig zag stitch for the top of the mouth, added 2 buttons for the eyes and then just hand stitched the antennas with embroidery thread. What do you think? 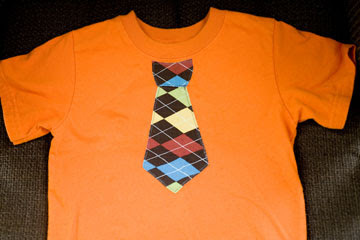 Next up, a shirt for Skylar and some neck tie onesies. JOOOOOYYY....these are great!! difference btw you and me: i see something really cool and put it on a "one day i'll do that" list but you actually DO it. fabulous. Oh How Great!! Love BOTH of them!! 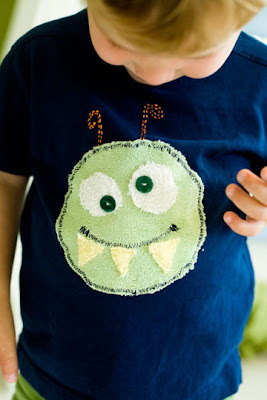 that monster shirt is adorable! good idea to use the washcloths. i have that same list Ginine! Great job Joy! So cute!